Today is me and my twin brothers birthday and we are now 12! I decided to do a birthday bird count just for fun, I was hoping to see 7 different species. The cold doesn't help here, last night it was under -50 C (-58 F) with wind chill!! BRRR!! 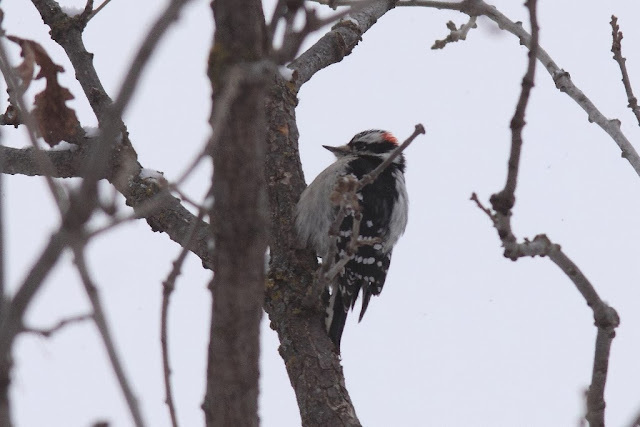 I watched from the windows and counted some birds, 3 Downy Woodpeckers, 2 White-breasted Nuthatch and 10 chickadees. I only had three species, I was disappointed that I never saw the two Harris's Sparrows that were crazy enough to stay the winter. I decided to go outside and see the Great-horned Owls, maybe some magpies or ravens also, that would have brought my list up to six species. But... I never saw even a single bird out back, not one! Too cold for the likes of them I guess. My list was still at 3. 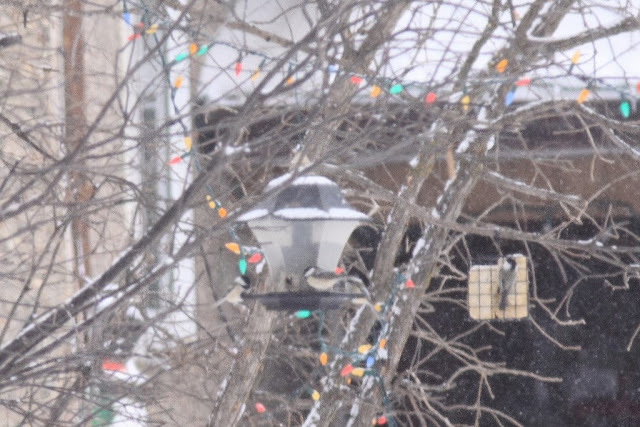 As we did stuff around the house a Hairy Woodpecker came to the feeder. Yay! 4 species! Still not as many as I was hoping for, today was just to cold. I moved the 'Birds Around My House' page to a link on the side. I haven't really worked on it at all and don't know if I will, but I kept for those who want to still look at it. I did it to free up some space on the page bar for room for life list pages. I counted 134 bird species in total this year, I guess that counts for my all time life list also, this Spring is really when I started to be very serious about birding. I think I started watching the birds a lot sometime in the Winter so that means I have been birding for a year. I hope to get a fresh start in 2014 and add to my life list a lot. I want to look for shore and water birds more in 2014. In 2013 I was mostly just watching the birds in our yard. I can easily bike to the floodway to watch shorebirds there or a old gravel pit that has kind of turned into a park with paths and ponds. Birds Hill Provincial Park is a bike ride away from our house also. I went out with Christian Artuso numerous times this year, he has helped a lot. 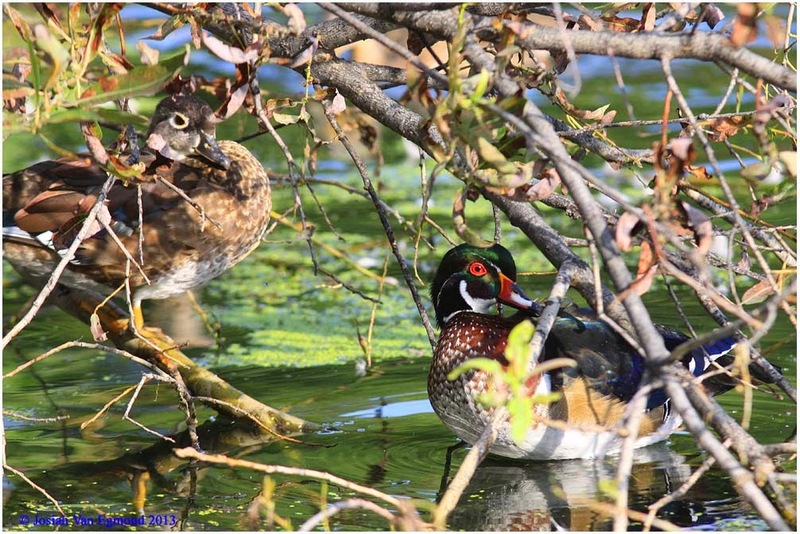 We went out together in early Spring at Oak Hammock Marsh, in early fall at Assiniboine Park, in late fall around Grand Beach and we were counting together at the Christmas Bird Count at Oak Hammock Marsh. HAPPY BIRDING AND NEW YEAR! Thanks to Prairie Birder for the FoF idea. Click here for her post. Merry Christmas all!!!! I got a Bird Watching magazine, a little bird house, a owl bookmark, and my little sister sowed a bookmark that says 'Birds In Your Backyard'. Besides the other presents that I got, I got an Irish Tin Whistle which I wanted. 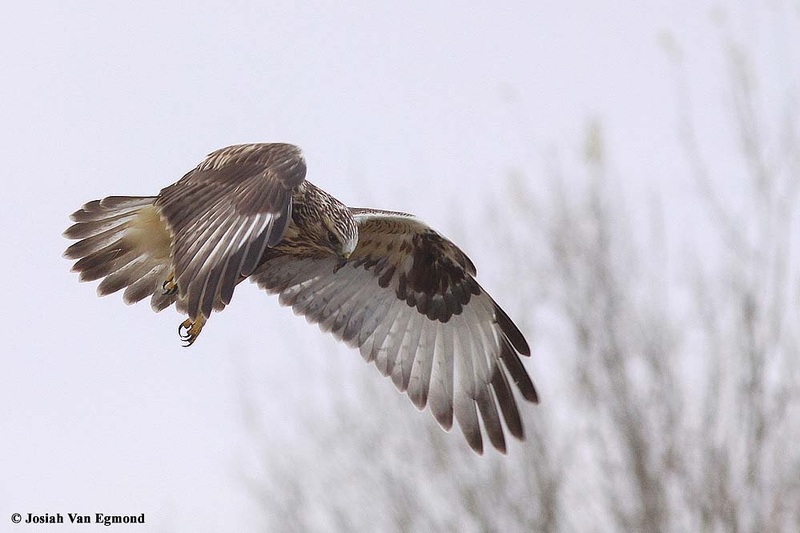 Okay, on a different matter, can you guess what bird this is? Thanks for Prairie Birder for the FoF idea. Click here for her post. At Assiniboine Park with Christian Artuso, can you guess what this bird is? Last weeks was a bit harder than I thought, honestly I thought it was easy and everyone would guess it right away. It even fooled Christian Artuso, a professional, but in the end Neil guessed it correct, the bottom side of a Blue Jay. This weeks should be a little easier. I bought a IdentiFlyer Singing Bird Alarm Clock when I was in Ontario. I really like it and it would be a fabulous Christmas gift! You can buy different song cards for it to play different bird sounds. The Peregrine Fund has a host of great gifts, T-shirts and clothing, Christmas ornaments, water bottles and mugs, carved raptor pens, raptor posters, puzzles and games like Bird-Opoly, hats or their 2014 Raptor Calender and a selection of other things. A nest box would be a great gift for Christmas! Tree Swallows at nesting box. 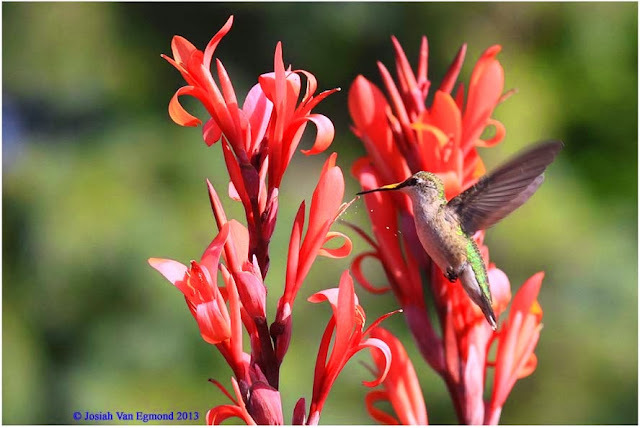 See Prairie Birder's post Holiday Gifts for Birders on her monthly Bird Canada post. On Saturday the 14th I went to a Christmas Bird Count at Oak Hammock Marsh. Oak Hammock Marsh is a 36 km² Wildlife Management Area and birding hotspot home to 300 species of birds. Since Oak Hammock Marsh is nearly 40 minutes away from where we live, we woke early and met at 7:45 AM at the Marsh Interpretive Centre. We were divided into groups, me, my dad, my twin brother and Christian Artuso were in one group. We had to cover different zones that we were assigned. We had zone ten to do. I circled Oak Hammock Marsh to show how wide the circle of zones is. Our zone is 10. We set out at about 8:00. 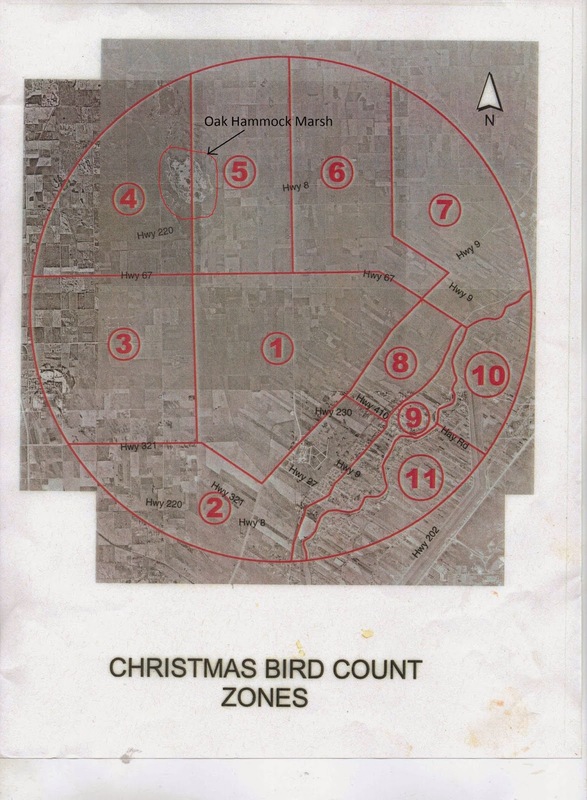 The count really wasn't just at Oak Hammock Marsh, actually the edge of the circle of zones is over 20 km away from the marsh.We used the map and drove around our zone, lots of the time looking for bird feeders to count birds. 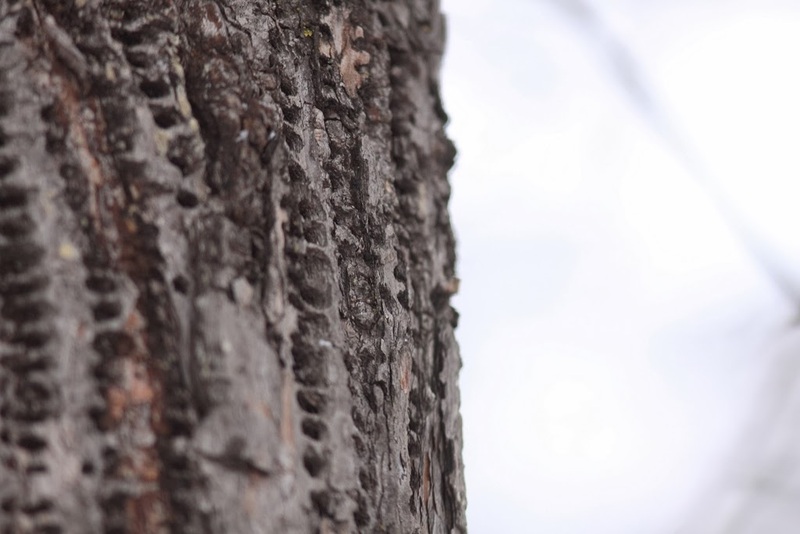 There were lots of chickadees and by the end we counted 85 of them. We drove around finding bird feeders or every once in a while stopping and listening. We mistook a white round antenna thing for a Snowy Owl until my brother took a picture and zoomed way in on it. We walked down a railway track for a couple minutes but that didn't really produce anything so we went back to the car. We found a really good place that we counted 4 Hairy Woodpeckers, 4 Blue Jays, numerous chickadees, a Downy Woodpecker and even 2 Dark-eyed Juncos, which was a bit of a treat. We heard a Evening Grosbeak call once, I had never seen or heard one before, a new one on my life list. We also found some sapsucker wells at the same spot. 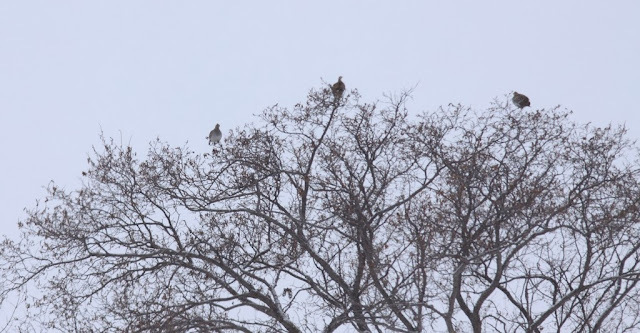 We saw 33 Sharp-tailed Grouse, the record of the most on any Oak Hammock Marsh Christmas bird counts. Sharp-tailed Grouse was also a new one for me. There was a single Snow Bunting that we saw flying over. After we covered our zone we headed back for a hot lunch at the Oak Hammock Interpretive Centre which started at 11:30. We were in zone 9 driving back to the centre when Christian suddenly called out to stop the car. 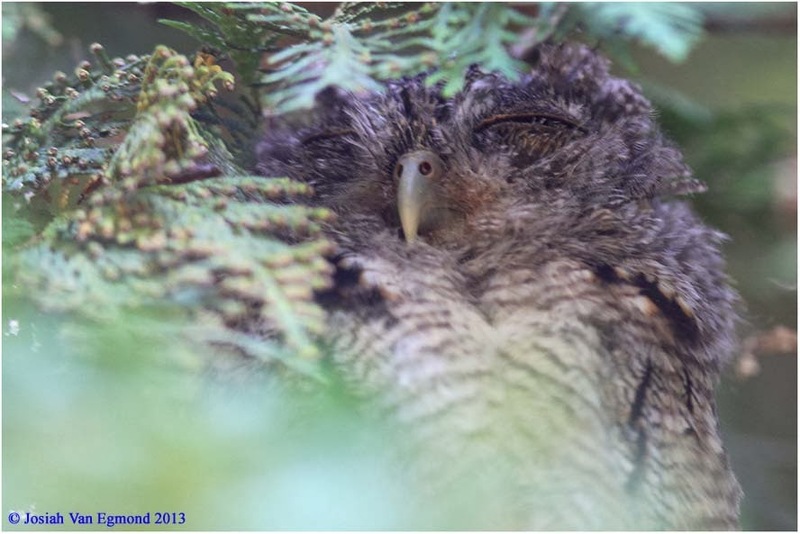 We hopped out and he pointed to the owl sitting into a tall evergreen tree. It was a Northern Hawk Owl. These owls aren't very common here so it was quite the find. Me and my brother got lots of pictures. After watching it for a bit we decided to go back. 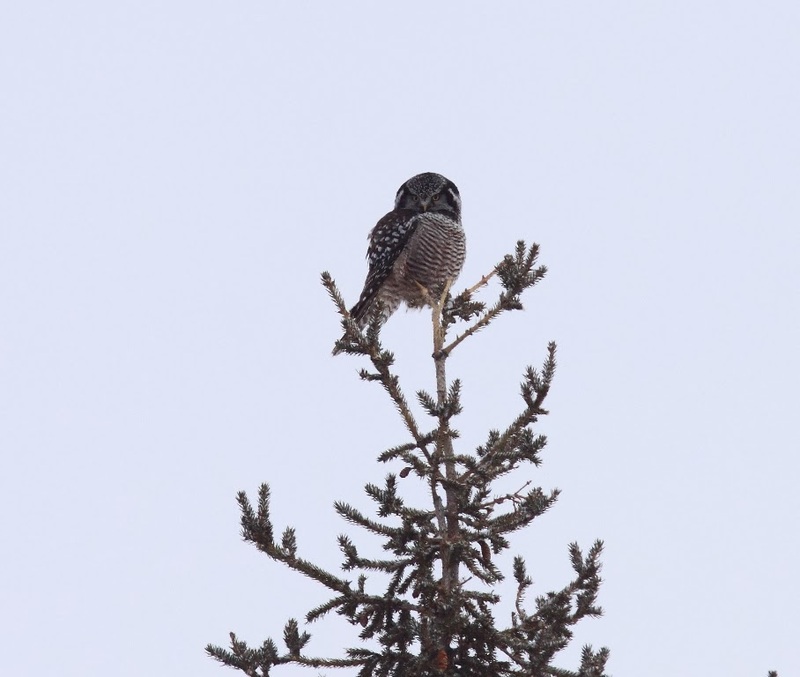 Christian said that Northern Hawk Owls were fairly friendly and wouldn't too easily fly away from us. 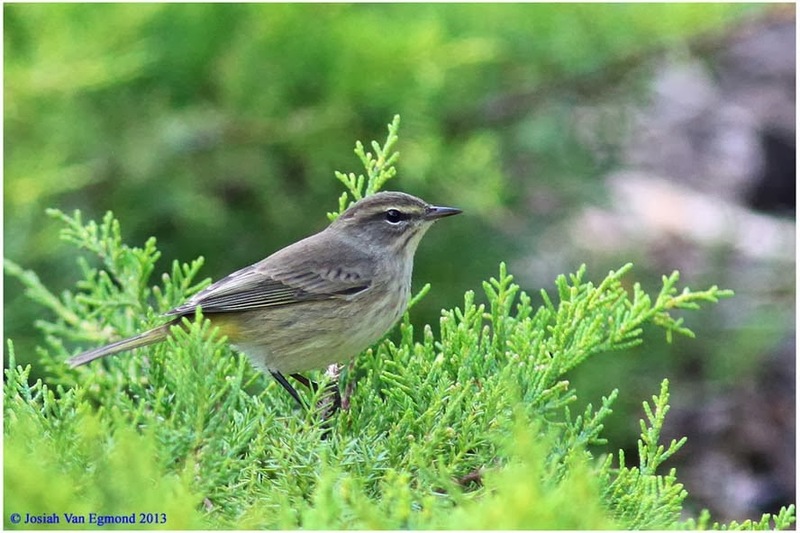 There were prizes for the group with the most birds seen, the most species seen, and the best bird. We won with the most species seen totaling 13, we each got a Oak Hammock Marsh water bottle. Another group won with the most birds seen, over 1000 while we only got 165 (they saw a flock of Snow Buntings). Everyone voted on the best bird, ours we had as Evening Grosbeak because we never saw the Northern Hawk Owl in our zone. It was close between our Evening Grosbeak, a Red-winged Blackbird and a Northern Shrike. In the end we were tied with the Red-winged Blackbird. But both of us had already won prizes so we passed the prize onto it on to the Northern Shrike team. 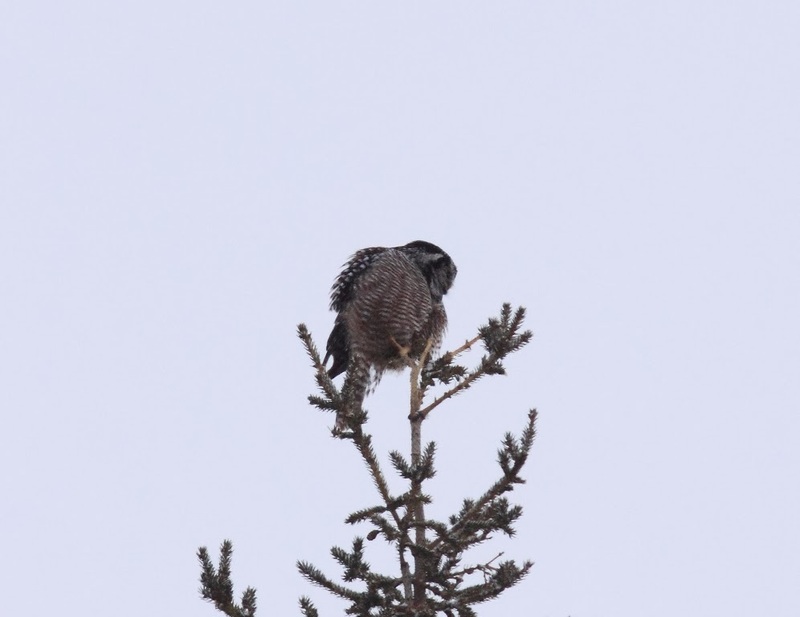 On our way home we checked if the Northern Hawk Owl was still there but it wasn't. When we were gone my family saw a Pileated Woodpecker as you read in the previous post. 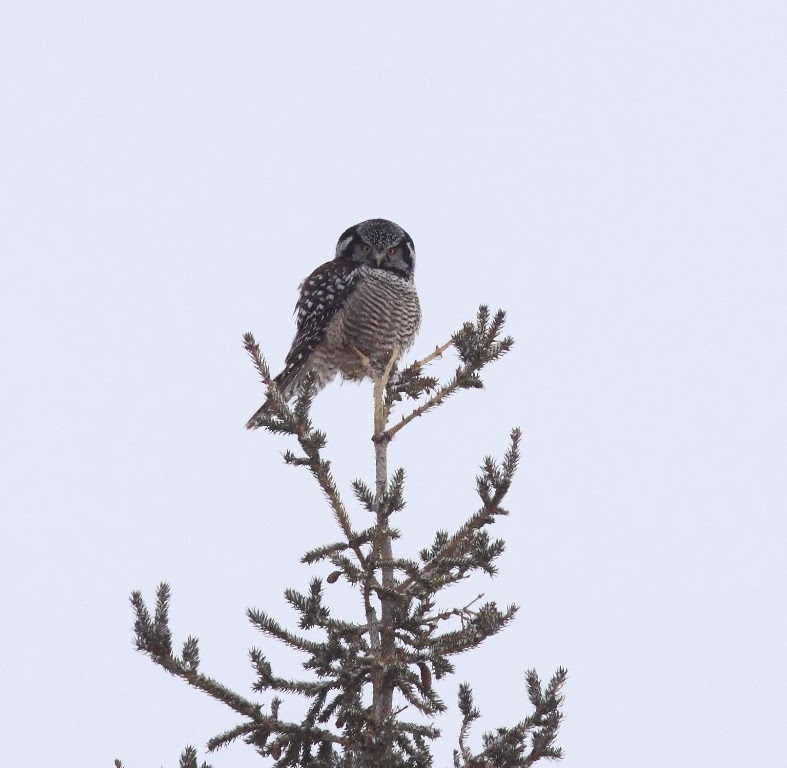 I had a very fun time and now have a few more birds on my life list, and saw a Northern Hawk Owl! 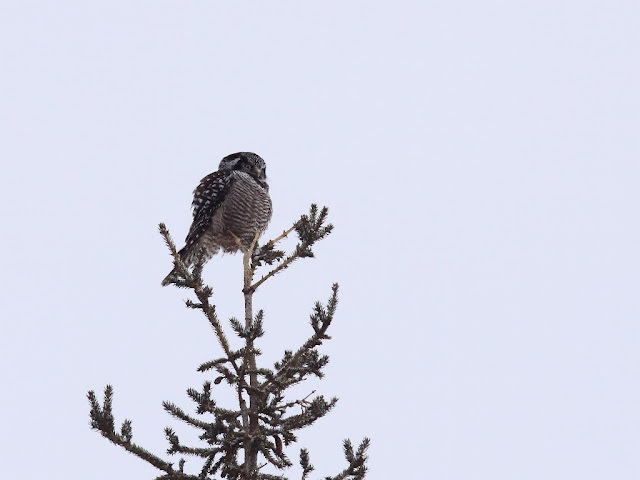 Hands down, the best bird was this wonderful Northern Hawk Owl! While Josiah was at the Christmas bird count today, I (Josiah's brother William,) saw some birds at the feeder that we usually don't get to see. I saw two Harris's Sparrow's and a Pileated Woodpecker, unfortunately Josiah had our Canon T3I so I had to settle for our old camera, a Sony Cyber shot DCS-H55. For the past week or so there has been a Great-horned Owl staying in our small forest. It has been coming back year after year, for many years. I have been waiting to make a post when I get a picture of it. A couple times I went out and saw it, but never had time to get my camera out of my coat (I keep it in there when outside and not using to keep it warm). I was going to go out today to look for pellets under trees so I have an idea of where it is roosting (as Christian Artuso suggested to me). It saw me way before I saw it. It flew up and away. I never had enough time to take out the camera. Suddenly I heard something behind me and another one flew over me. I was surprised but quickly snapped a photo. I was so excited! Finally I got picture! My first picture of a Great-horned Owl! 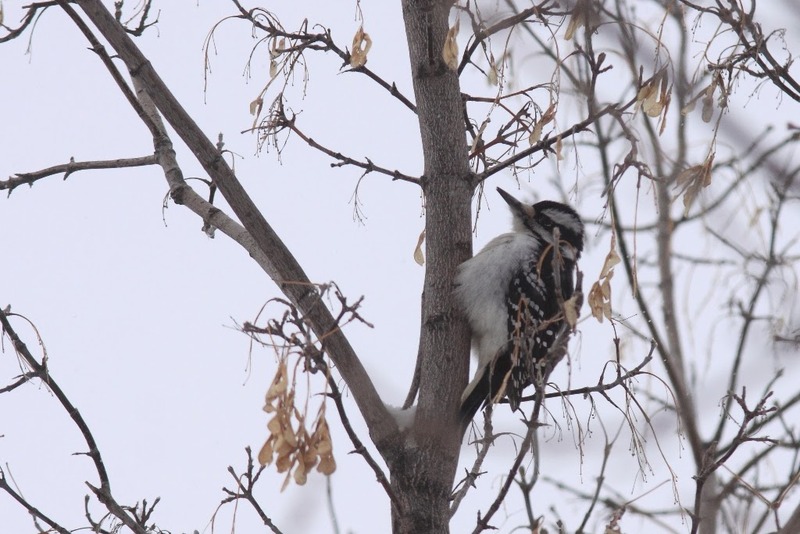 On the way back I watched other birds, there were a lot of Downy Woodpeckers and chickadees. 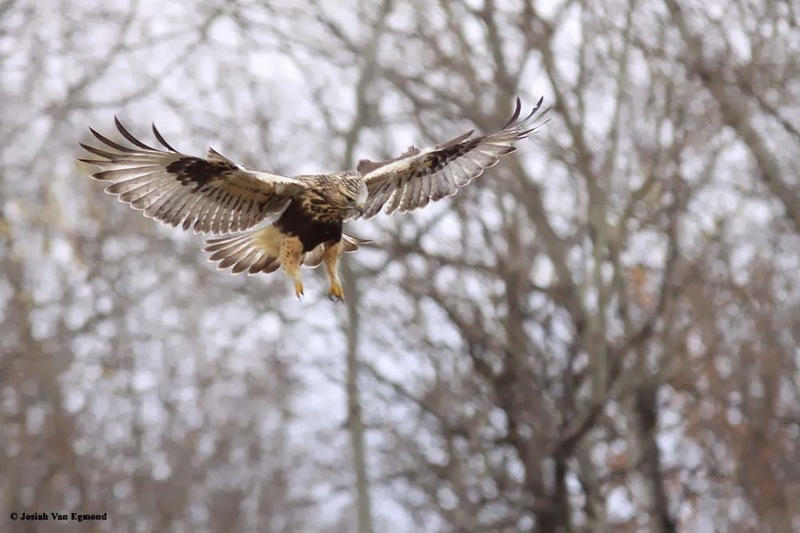 I was lucky and snapped a picture just as it was flying away! Black-capped Chickadee flying with food. Thanks to Prairie Birder for the FoF idea. Click here for her Feathers on Friday post. New Weekly What Bird every Wednesday! If you make your own Weekly What Bird post and put the link in the comments I'll put the link in the post. Can you guess what bird this is? Last weeks bird was pretty difficult, immature Chipping Sparrow!! Whitney and Matthew both had very close guesses. I have adopted the name 'Backyard BirdWatcher'! Instead of just 'Van Egmonds'. Thank you to everyone who visits this blog. Also I was surprised to see today a bunch of goldfinches at our feeders! Two days ago there was Harris's Sparrows also. I don't know if it is odd for them to come this late into the winter here. Harris's Sparrow, although I took this photo about a month ago, the Harris's Sparrows are surprisingly still here! Thank you to Prairie Birder for the FoF idea. Click here for her post. New Weekly What Bird post out every Wednesday. Create your own Weekly What Bird post and put the link in the comments and I'll put the link in the post. 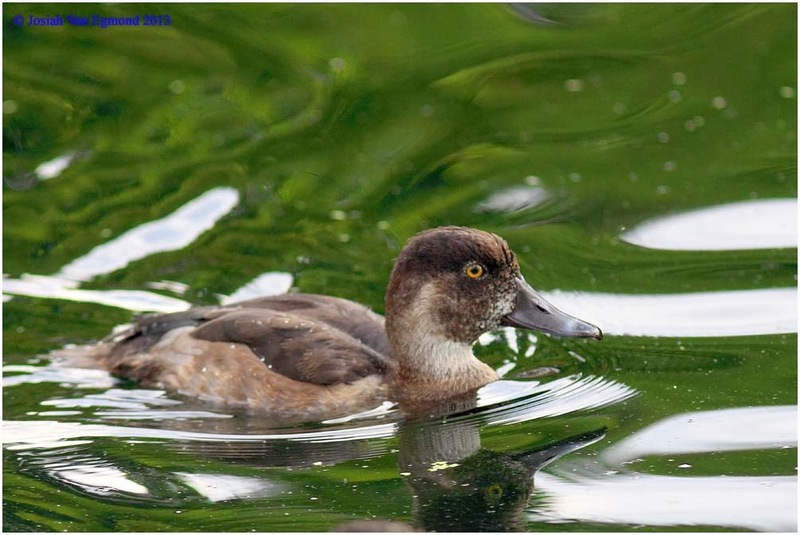 Neil and Bird Boy got very close to guessing last weeks but that bird was a Ring-necked Duck. I saw a huge flock of birds fly over our house the other day. I snapped some pictures as they flew over a couple times. They went out of sight for a minute, then they dove down and swooped right by our feeders. I saw a flash of color and thought they might be Evening Grosbeaks. They swooped down again and landed. Then I could clearly see they were House Sparrows. There were so many! I had never seen that many together at once. They flocked on the driveway but when our dog scared them away they all flew to the back feeders. The snow used to be all flat until the House Sparrows came.